From Global BC video of one of three crashes by a car jacker. 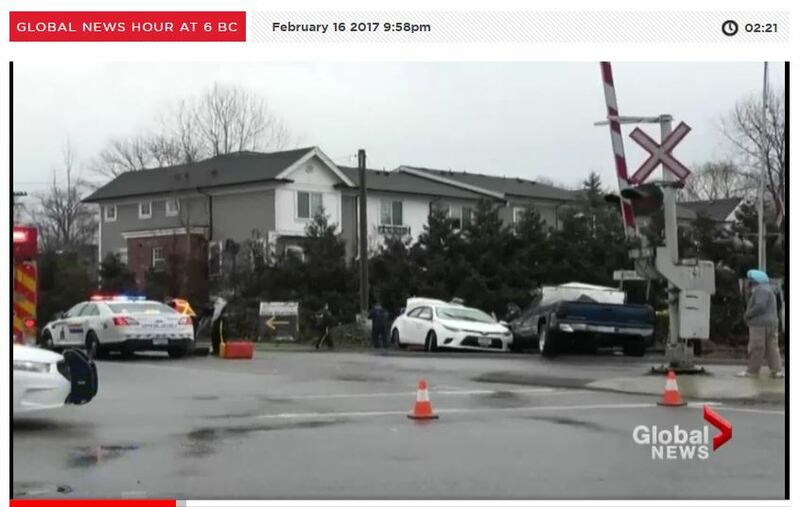 Thu, Feb 16: A wild scene in Port Coquitlam, where police are looking for a suspect in no fewer than three dangerous crashes, and a carjacking. Jennifer Palma has the story, including some dramatic surveillance footage of one of the crashes. Coquitlam RCMP are looking for a man who sped away from police, carjacked a vehicle and caused three crashes. Police got the call at 10:00am today as a possible impaired driver in a parking lot in the 3000 block of Lougheed Highway. When police arrived, the driver sped away and hit another vehicle in the parking lot as he left. Due to the potential danger to the public police did not pursue the driver when he sped away. Within moments the suspect crashed the truck on railroad tracks at Westwood Street and Kingsway. The suspect then carjacked a vehicle and sped away again but got into a third crash that disabled the just-stolen car. The suspect was last seen running away from Kingsway Avenue near the Coquitlam River. Fortunately no members of the public have been seriously hurt , said Corporal Michael McLaughlin with the Coquitlam RCMP, but causing three collisions and carjacking a vehicle is obviously beyond reckless. We have many police officers working on this file including Air One and RCMP Police Dog Services. We have a suspect in mind and are actively looking for him. The suspect is a darker-skinned man in his thirties with short hair, tattoos up to the neckline and a black, Crooks and Castles hoodie with a gold chain. If you see the suspect, call police. PORT COQUITLAM (NEWS 1130) – Mounties in the Tri-Cities are searching for a man police believe is at the centre of a carjacking and multiple crashes this morning. .@cqrcmp dealing w/carjacking, several crashes. Looking for suspect: dark-skinned man, gold chain, short hair and white shoes. Det. to come.